is on the Top Producing Sire List for the FOURTH time!! 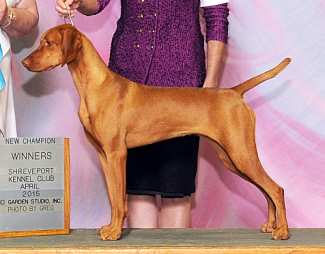 and Mojo sired his FIRST Top Ten Vizsla! finished 2017 as the NUMBER ONE Vizsla in Breed and All-Breed rankings! We are SO VERY PROUD of all our dogs and CONGRATS to all their owners!!!! What an amazing year 2017 was for Team Renaissance. We would first like to thank all our puppy buyers who provide such loving homes for our puppies. We enjoy hearing from you throughout the year so keep those cards and photos coming! We would also like to congratulate all those who competed with their dogs in 2017. This year was another successful year for Renaissance as Konner sired two dogs in the Top Ten - Conformation. Congratulations to the following Konner kids, their owners and breeders on your new titles in 2017! All this would not have been possible without the dedication of all our puppy buyers. We thank you all for making our dreams...................REALITY!!! We LOOK FORWARD TO 2018 with MUCH anticipation!! FLASH ** Renaissance Vizslas have bred SIXTEEN different Group Winners in SEVEN different countries, including the US of A. The group winners are - Rosita, Holly, and Cruise in Mexico; Konner in Canada; Teddy in New Zealand, Falco in Brazil; and Journey in Argentina and Chile!! Group winners in America include Konner, Faith, Flirt, Rosita, Mojo, Rugby, Smooch, Koda, and Envy! Congratulations to Emily and Sugar, CH Stormwinds Kizmar Lips Like Sugar, on their new Junior Handler team. We are so excited about their future! Copyright 2010-2016 © Renaissance Vizslas. All rights reserved.